Huge scope to boost trade, could increase opening hours and introduce deliveries. Hilton Smythe is delighted to introduce to the market John’s Supper Bar with 2 self-contained flats. The Takeaway has been a supper bar for many years, our client took over 7 years ago, completed a refit and changed the name to John’s Supper Bar. During this time our clients have built up an excellent rapport with the regulars and have enjoyed their time running the business, unfortunately health issues are forcing the sale. John’s Supper bar offers a menu of Chinese meals, English meals, burgers, kebabs, pizzas etc. The business operates from modern premises, fitted with a high level of equipment and modern furnishings. John’s Supper Bar has an outstanding reputation for the quality of produce all freshly prepared on-site and is very well known in the area, having a high amount of repeat trade as well as benefiting from passing trade due to the excellent location, the shop is also extremely busy on football match days, with customers cueing down the street. There is also a pub on the same block therefore would benefit staying open later. The area is currently undergoing a few developments, including a large hotel being built in the proximity, this is going to generate more custom. There is plenty of scope to increase the turnover by extending the opening hours. A new owner could embark on a modest marketing campaign to highlight the excellent goods and services offered, offer a local delivery service, utilise Just Eat and Hungry House etc. Above the shop are 2 self-contained 1 bed flats, currently both tenanted on 6 months tenancy agreements. The flats are generating £800 pcm rental income. They could be used as living accommodation should the purchaser require. Current owner happy to offer a handover. Turnkey business as all equipment is included in the sale. Includes owners' accommodation or rental income from the flats. Early viewings come highly recommended, our client is open to sensible offers. 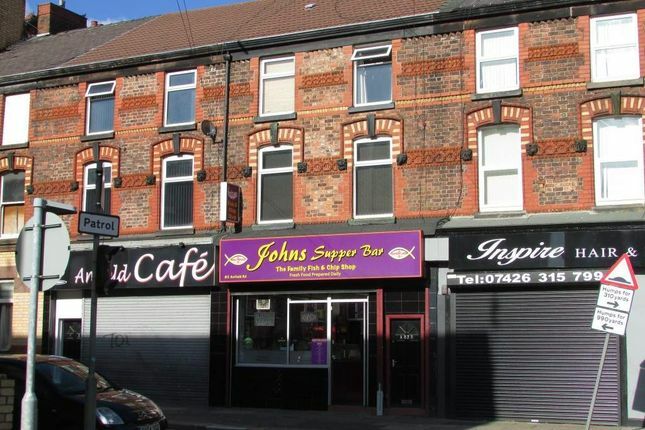 John’s Supper Bar is located in Anfield Road, Liverpool. Just 300 yards from the Football Stadium. The business is within a large residential suburb surrounded by a wealth of complimentary shops and businesses and benefits from a high volume of footfall and passing trade. The area of the business is well served by the public transport system, with several bus stops and the train station within easy walking distance of the property. The area is also well served by the a-roads, with the A580 being within easy driving distance of the business, which links to the M57 motorway network. Large 4 story premises with great signage and well maintained throughout. Boasting an excellent trading location. Large basement currently used for storage, large enough to convert to a preparation room. Service area with modern décor and menu boards. The premises are fully alarmed and has a CCTV system. Owner ran with casual staff members covering match days. The financial reports show a turnover of £150,000 for the financial year of 2017-2018.